Four years ago I wrote a Valentine’s Day post that’s really more interesting than this one, about how the thought of romance in a restaurant was a scandalous at least until after WWI. It’s one of my favorites. This year I thought I’d explore pre-1980s restaurants that specifically advertised special dinners for Valentine’s Day. What kind of food did they typically feature, I wondered? Turns out I found way fewer of them than I expected, especially before the 1970s, which seems to be the decade in which the idea of a going out to a restaurant for a Valentine’s dinner took off. Most of the dishes I found in advertisements sound less than wonderful to me. Unless you like Chicken a la King on Crisp Noodles accompanied by a “molded cherry salad with creamed cheese and nut ball center.” That was from one of the earlier advertisements (1957) for Clark’s in Cleveland (pictured above). Call me unromantic, but I don’t picture myself sitting there eating jello. 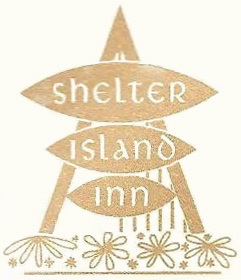 Ditto for the Strawberry Gelatin Salad at the Shelter Island Inn in San Diego, 1972. Rare New York Strip steak, maybe, but no thanks to the Artichoke Bottoms filled with Petite Green Peas. Does that say Be My Valentine to you? But, console yourself. 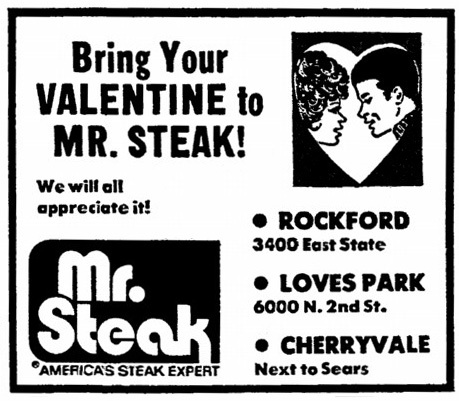 If you lived in Rockford IL in 1975 you might have been munching on a Perch Dinner accompanied by Complimentary Glass of Pink Champagne at Maggie’s (All You Can Eat, $2.25) or dining at Mr. Steak. 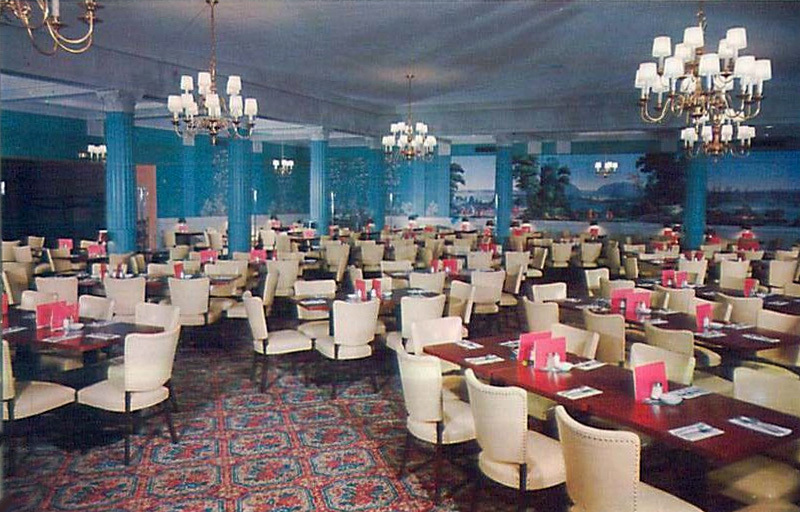 My favorite advertisement was the dinner at the Thai Pavilion in Springfield MA, 1976. No sign of Thai food whatsoever. Instead, the menu featured Baked Stuffed Shrimp, Prime Rib, or Filet Mignon with Tossed Salad, Baked Potato, and a Fudge Pecan Cake Ball. 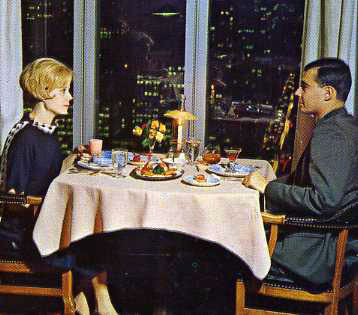 Dinner served from 5 pm to midnight, $21 per couple. Did I mention the Thai Pavilion was handily located in a motel? Happy Valentine’s however you celebrate. No corsages, please. Have to agree. It’s like New Year’s eve. Fun post. Love the photo of Clark’s in Cleveland.